Here are my strong recommendations on three films that illustrate the history of film and music and how technology has affected both art forms. All three films are fascinating and deserve our attention if we care about the popular culture that affects our lives. The first episode covering 1895 to 1918 starts with early moving pictures made by Thomas Edison in New Jersey and the Lumière brothers in Lyon, France. Cousins pays attention to changes in film editing and the evolution of movie theaters from nickelodeons to grand movie palaces of Egyptian, art deco and other exotic decor. Side by Side shows the history and workflow of both kinds of filmmaking and illustrates what is gained and lost in both processes. 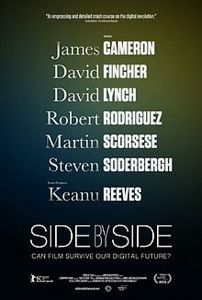 Keanu Reeves is host and interviews directors and cinematographers about how the technology affects their filmmaking. The film points out that digital production democratizes the filmmaking process because a filmmaker can go out alone with a single piece of equipment. A digital camera does not require the elaborate equipment and crew that celluloid film does. And it makes every film ever made available for instant viewing. That’s how I can watch old foreign and indie films now on DVD or streaming. But many directors are saddened or angry by the change and insist the color and image richness of celluloid is lost in digital technology. 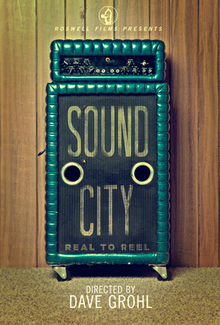 The 2013 documentary Sound City tells much the same story about the music business. The 108-minute film, directed by musician Dave Grohl (Nirvana, Foo Fighters), tells the story of the legendary Los Angeles recording studio where bands like Tom Petty and the Heartbreakers, Nirvana, Neil Young, Johnny Cash, John Fogerty, Nine Inch Nails, Rage Against the Machine, Fleetwood Mac and Rick Springfield made great music. Sound City never really joined the digital revolution and continued its tape-based recording in a venue where every room had its own sound quality. But once the digital revolution began, its demise was in sight. Many musicians still prefer the richer sound of tape-based, analog recording. But Sound City and the other great recording studios have disappeared. Grohl bought the original Neve soundboard from Sound City and has it installed in his own Studio 606. This is a fine documentary, telling the story of a landmark musical institution, its impact on rock and roll, and its demise, slain by technology. Drummer/guitarist Grohl proves himself to be a filmmaker too. The film will be shown again a few times this week on Palladia or VH1 Classic. And you can buy it from iTunes or on DVD.